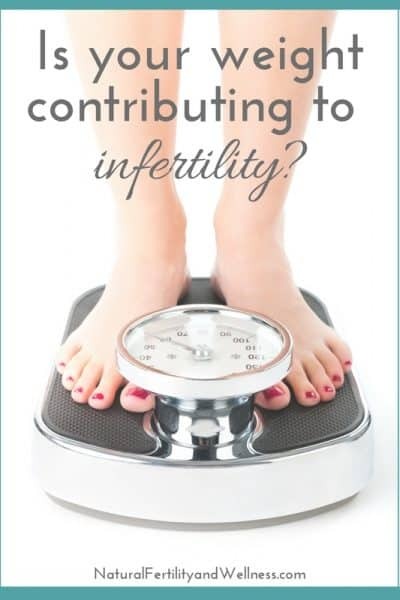 Is your weight contributing to infertility? We’ve come a fair distance in body positivity and acceptance. The US culture is become more and more open to the idea that not everyone is meant to have the same body type. And there’s so much good to that! No one should be made to feel like their body is not the right kind of body, because all bodies truly are good bodies! All that said there are times when our weight affects our health in negative ways. 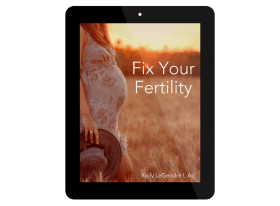 And both underweight and overweight individuals who are struggling with infertility may find that their weight is impacting their ability to conceive and maintain a pregnancy. Nobody, and I mean nobody, wants to hear that their weight could be an issue – the reason they haven’t been able to get pregnant. Especially women. 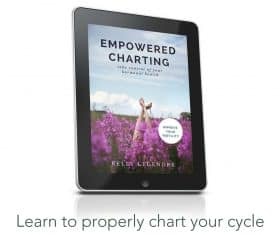 But losing weight (or gaining weight if you’re on the other side of the scale) can greatly help you boost your natural fertility. In fact, being at a healthy weight can actually undo your infertility. Your ovaries and fat cells actually regulate your estrogen levels. If you are considered under weight, your body basically goes into survival mode, or “fight or flight” mode. Simply put, when you send your body the signal of “there’s not enough” the body is going to shut down. No “body” wants to conceive a baby when there’s not enough nutrition to go around. Furthermore, when in survival mode you aren’t producing enough estrogen. All of these things, and more, are why your menstrual cycle can stop completely if you’re underweight or working out strenuously; your body’s way of stopping you from getting pregnant when you are not nourished well enough. Studies have even shown up to 50% of women who are underweight for their height and body structure are infertile. If you are overweight this negatively effects you as well. One reason why is that excess fat causes excess estrogen throughout your body. Too much estrogen and your hormonal system is out of balance and may not produce healthy eggs or release them at the correct times. Obesity has even been associated with an increased risk of early pregnancy loss after IVF and a decreased rate fertilization. The best thing to do is not “diet”. Honestly. Especially not a crash diet. For when you crash diet, your body goes into starvation made and your metabolism slows. Plus, such a drastic measure can upset your hormonal balance even further. Not something you want to do while trying to get pregnant! The best thing you can do is slowly change your diet to include more fruits, vegetables, and high quality meats and dairy, skip the fast food and candy bars, and move a bit more. Find fun and engaging ways to move that don’t feel like a chore or a burden. Maybe it’s a team sport. Maybe a class. Or a solo activity that gets your heart racing a few times a week. Make sure you eat breakfast, lunch, and dinner along with a couple healthy snacks during the day. If you are a chronic over eater, start taking less on your plate at each meal. Change just one thing each week or each month if need be, but just start making changes. Make sure you don’t cut out fat, though – it’s essential to hormone production! And if you are one of those that need to gain, make sure you are eating high quality, regular fat foods. Include an extra meal or snack into each day for another few hundred calories. Just remember, although you need to gain, it doesn’t mean you get to pig out on junk food! If you’re still having problems gaining weight, it may be time to look into thyroid or adrenal involvement or gluten intolerance, dairy intolerance, or other dietary concerns as a contributing factor. When you’re making food and rhythm changes, though, don’t be too hard on yourself! Too often we start out with all these large intentions and last a few weeks and then we fizzle. That’s because we’re treating food as a mechanism for nutrition rather than a complex organism of sorts that we have a layered relationship with. Be sure to explore your relationship with food to make sure you’re not just making will-power driven changes. And I hate to mention this over used phrase for those TTC’ing, but when referring to your weight, “Don’t stress about it”. While your weight may be a factor in your infertility, try not to worry about all that weight you have to lose. Research shows that just a 4% increase or decrease in weight, depending on where you are in the spectrum, can help balance the hormones out enough to where ovulation occurs and a healthy egg is released. It’s not an overnight cure, but it is also something that will help you in the long run to have a healthy pregnancy once you do conceive. I know I need to lose a few lbs! Great post! I am a big believer that people trying to concieve should make sure they are in the best possible health. I grew up heavy and didn’t lose the weight until college when I did it the right way (over time adding exercise, and changing my eating habits). I think I have to add you to my google reader! This is a good post. Thank you. This is exactly what I want to do. Not diet but change the way I eat. Thanks for posting this. I really need to hear the “don’t diet” thing. After stress eating all summer I know I should loose more than a few pounds and want to just starve myself (which I honestly couldn’t do anyway), but reading this helped me think about just trying to eat healthier before our November IVF. I wish my problems could have been simply overcome by healthier eating and living naturally. You have a great site! I'm working on losing weight as we speak, so this post was encouraging to me. Ah, thanks for the encouragement. 🙂 A trick that I sometimes use to help me keep from over-eating (think ice cream — that’s my weakness! ), is to use a smaller bowl. That way it looks like I’m having my giant bowl of ice cream when I’m really not!